We made good time covering the 160 miles from Vicksburg to Shreveport arriving at our friends John and Linda's home around 11:15AM. I had worked with John 10 years ago when he was with the local power company. We parked in the driveway and set up camp. After lunch we had a guided tour of Shreveport covering the new Louisiana Boardwalk outdoor shopping mall beside the river. Included in the mall is the biggest Bass Pro Shop ever with giant fish tanks, alligator pool, hanging sea plane and 30 ft Adirondack's fishing boats nailed to the walls. We then toured the old town including the theater where the Louisiana Hayride radio program was held. Bronze statues of Elvis Presley and James Burton grace the entrance. The highlight of the tour was a visit to Tubbs Hardware and Rentals Cajun Gifts shop. 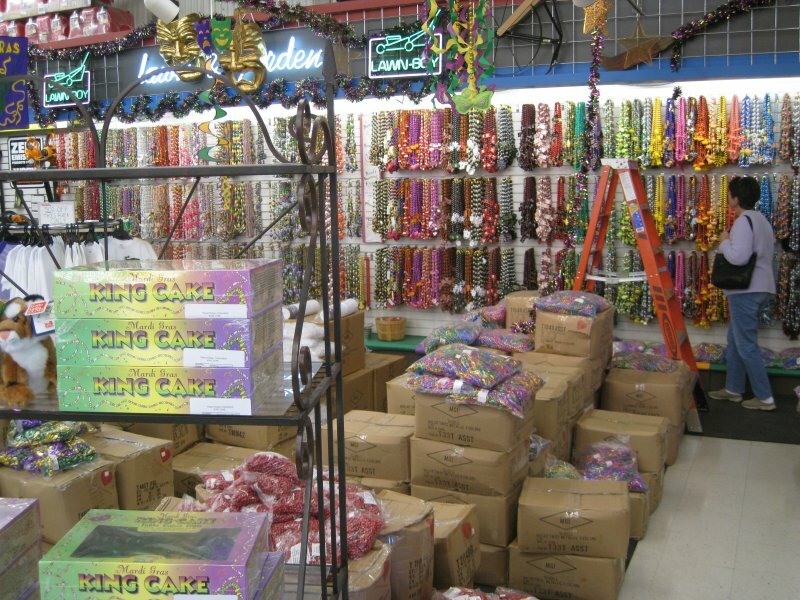 At this time of year the shop specializes in Marti Gras beads and King Cakes, etc. Linda cooked a delicious shrimp etouffee which went well with Mavis white wine and the King Cake. Tomorrow we start a three day drive across Texas.